Well, looks like I missed #4. Specialty: This single-seat pedal racer may look old school, but with a blown engine, side exhaust and plenty of style, it's geared up to pound the competition. 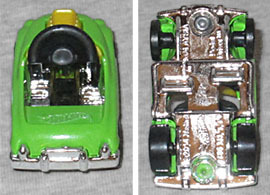 The Pedal Driver, Ride-Ons #5 of 5, was introduced in 2015, in both red and blue versions, but they weren't intended to accommodate minifigures - or, if they were, they were poorly designed. 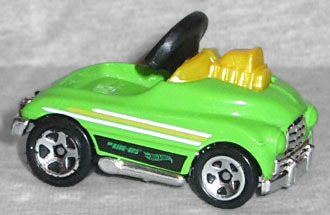 The vehicle is a little pedal car, the kind kids played in back before pow-pow-Power Wheels power made them go. It's stylized like an old-fashioned roadster, though one with a superdeformed aesthetic: short, squat, curvy, etc. The interior of the car is detailed enough that they actually bothered to include the pedals that would drive it forward. They don't move or anything - it's just the chromed base of the car, molded with the pedal shapes - but it carries the idea forward to a good extent. 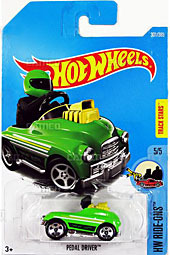 This year's Pedal Driver is bright lime green with a yellow engine and black and yellow stripes on the sides. There's also a "Treasure Hunts" version available, Hot Wheels' name for their ultra-rare chase figures - that one is a nice blue, but I'm never going to see one of those in person. As mentioned, the Pedal Driver was not originally accommodating to minifigs - the giant steering wheel made it so you couldn't get the legs into the car. It was retooled in 2016 (when it was available either in orange or a very nice black, but I sadly wasn't looking for these back then), cutting the steering wheel in half and making room for a figure to get in. 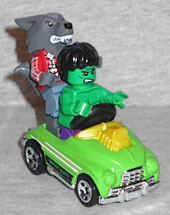 The wheel is sized for minifig hands, but there's nowhere else for a figure to attach - driving the car is the only option. But! If you push the driver as far forward as you can, there's juuuuust enough space for a second Lego figure's feet to fit snugly behind him - no pegs or anything, just a tight fit. I'd really prefer the 2016 black, or the 2017 Treasure Hunts blue, but hey, now I have two red Ride-Ons and two green ones; maybe my collection will come in pairs.